During difficult times, a tasteful, heartfelt gift can ,make all the difference. This gourmet basket from Harry and David® is ideal for such an occasion. It includes Royal Riviera® Pears handpicked in their orchards and a carefully curated selection of savory gourmet cheeses, including white sharp cheddar and Gouda. The grand version also includes fresh seasonal apples, salami, crackers, nuts and more, to easily accomodate a large family or group. A hand-tied bow and sympathy hangtag complete your comforting gift. During difficult times, a tasteful, heartfelt gift can ,make all the difference. 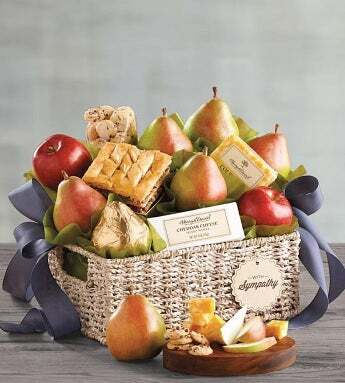 This gourmet basket from Harry and David® is ideal for such an occasion.